What is a sustainability certification? 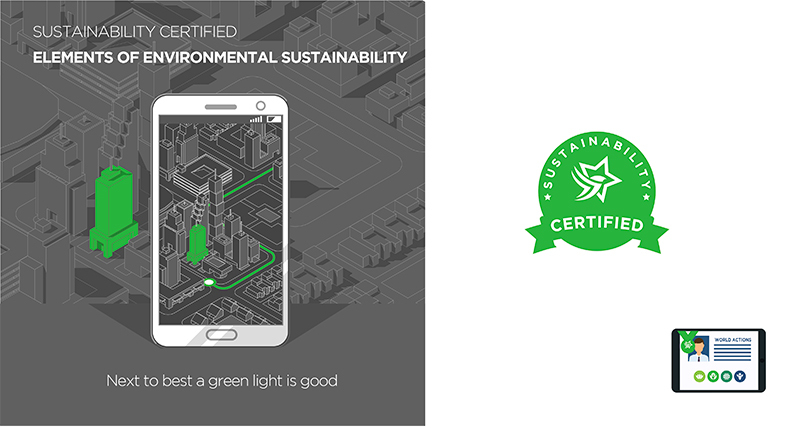 The Whogreen sustainability certification is a certification for Companies with World Actions. World Actions is a list of activities, which the Company is part of, that have a positive effect on the natural environment, the eco system, the climate or is part of a city’s overall sustainable development. How can you find out of the Company has a sustainability certification? The Company can place the sustainability certification medal at their website. The Company can display their sustainability certificate in their office. How many actions are needed to be certified? Companies who are certified shows at least 3 practical examples of how elements of environmental sustainability and corporate social responsibility results in clean air, water and land for the benefit of the planet and people. The element can be in the nature of: Something implemented, something planned, something desired or something which gives associated cases and companies a green effect. How are the actions shared with the public? Popular Icon Smiley’s decorate World Actions, so you can look for 3 or more Icon Smiley’s at the Companies Whogreen page. Also, many World Actions have their own group that gathers more Companies and people with the same Icon Smiley. WA Groups help to inform citizens about environmental sustainability. Actions of sustainable development within green categories. Demonstrations of supply and its effect and efficiency. Organized green on behalf of more Companies and people. Product labels and what they mean. Certifications and what they mean. Prizes/awards and what they mean. How can the World Actions be verified? World Action content is verified by trusting the information the Companies publish. Referrals to cases, labels and certifications are verified by the party in mention. How often is the World Actions researched? The World Actions are researched every year. An action can be shown with a date. New actions can be included, and older ones can be archived. How does the sustainability certification work? Companies and their activities are researched from the material they are already presenting on the web, by questionnaire and by interview. World Actions and their Icon Smileys are suggested to share the highlights of environmental sustainable actions. The Company can suggest World Actions and choose which ones to show to the public at their individual Whogreen page. The Whogreen network is a selective social network.